An Interview With The LA-Based Alt-Rock Duo, 222! 222 is a Los Angeles-based duo who creatively blend alternative rock, rooted in the ’80s and ’90s, with modern dance flair. Last week on February 22nd, they released their sophomore album, I’M NOT TRYING TO BE YOU…JUST KIDDING I’M TRYING TO BE YOU. “I’m Not Trying To Be You…” is also the lead single of this 11-track self-produced album via Howlin Hamard Records. The co-ed duo of vocalist Jade Howard and vocalist/guitarist Dennis Hamlin create a sound that’s both irresistible and mysterious on I’M NOT TRYING TO BE YOU…. 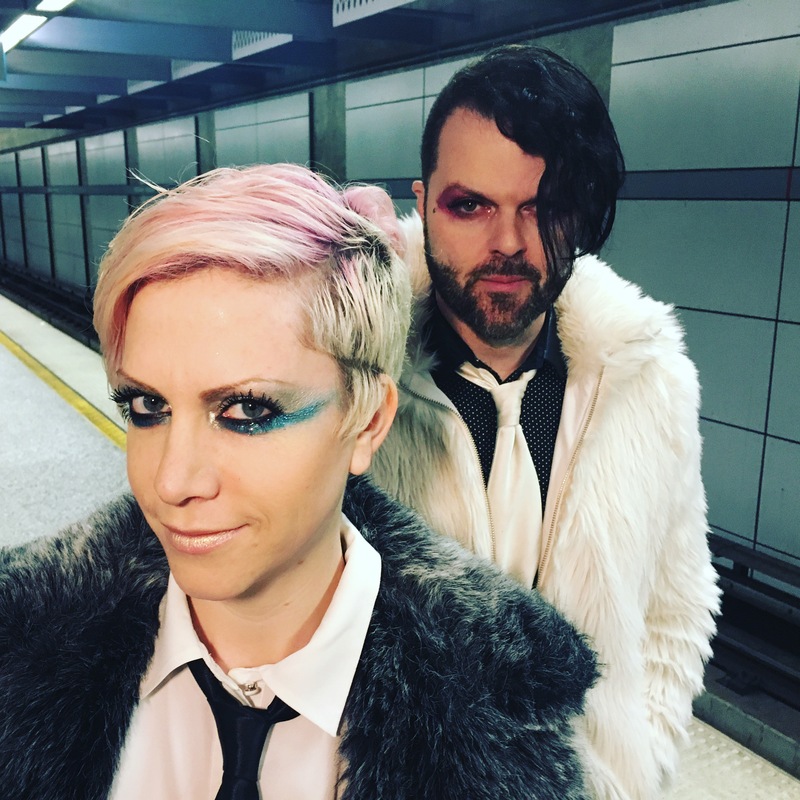 Highlights include title cut, “Heart Tied In A Knot,” “Dream Trigger,” “The Mortician” and “Everywhere We Go.” The prolific songwriting team of Jade and Dennis draw their musical inspiration from books, movies and life experiences. On the new album, they dive deeper into song concepts while keeping the emotional element sourced from personal places. 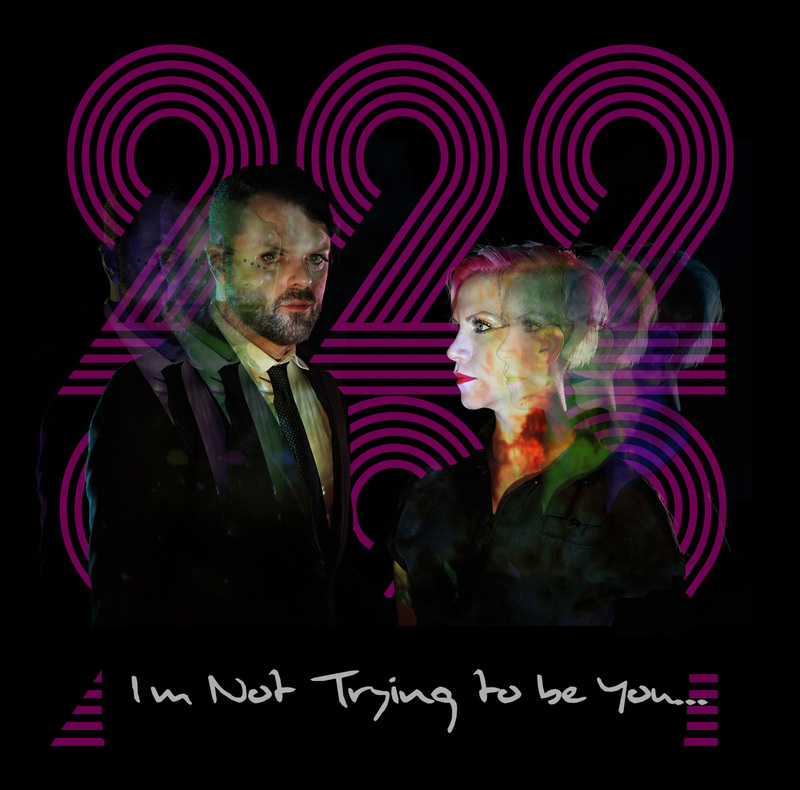 I’M NOT TRYING TO BE YOU…is the follow-up to 222’s debut album 2015‘s Libretto. That album’s first single “One Night Stand” earned them airplay on Los Angeles tastemaker radio station KROQ, among other radio outlets. 222’s high-energy live shows have built a strong following across the U.S. via a string of well-attended club dates in the South, Midwest, Southwest, and East Coast, including select club shows in Los Angeles. The band will be performing on March 25 at The Complex in Glendale, CA and on April 29 at Bar Sinister in Hollywood, CA. Plans to launch a tour in the spring are forthcoming. Dennis- Thanks, Ha! exciting, disappointing, inspiring, and eye opening. We lost a lot of idols and at the same time we wrote, recorded, mixed, and produced our second full length album which Jade will tell you is pretty much like child birth. I think the record may be a celebration and a monument to us for the heroes we lost in 2016. On the upside I think some of those losses inspired us to get this album done. Jade – Yeah, death has a way of kicking you to get things done because you never know when your time here is over. We also had a nauseating election cycle so let’s just say 2016 was bittersweet for us. What were some of the highlights for the band? What are you most excited about for 2017? Did you any of you make New Year’s Resolutions? Dennis – Recording this album was fun but we had some of the greatest shows yet last year and in areas we’d never been like Indiana and it’s so nice to see crowds so excited about original music they’ve never heard before. Jade – We are excited for 2017. We’re excited to see what’s going to happen not with just with the band but in the world. I think everyone’s waiting to see what’s next at this point. Our New Years Resolution – Rock! Jade – I always wanted to be an artist and musician. I wanted to be whatever Kurt Cobain was. Just able to express those deep dark emotions I had in a way that I could make my own. Dennis- I think I knew before I could talk that I wanted to be a musician. I had a fake guitar before I was 1 and would make sounds with my mouth for it and dance around. Can you talk about how this duo first came together? Why do you think you both work so well together? Jade- We came together because of our mutual passion for music. It’s our heart and soul, and we understand it in a similar way. That’s actually why we work so well together, we hear and feel the same things. It’s so amazing to be able to work with someone that you have an alternate level of intelligence with. Just Kidding. Dennis – Jade and me were friends long before we had this band. I actually moved out to Los Angeles with another band I was in at the time and Jade used to come and see that band. We actually stumbled on this band together one night a few years ago when we recorded our first single “one night stand”. We were both having drinks and just doing it for fun. The next day we woke up and listen to it and we were both like WTF? I think we both decided at that point we should try to record a full length album and it happened pretty fast. A lot of the recording from that night ended up on the final mix of the album. How did you come up with your band name? Was it difficult to settle on one name that described your music? Jade – The band name was actually decided before the band even became reality. It’s been a number that has followed our friendship since the beginning. Almost godly. Dennis – Yeah My birthday is on that day and I was born in room 222 and I met Jade in her apartment room number 222 when we first met. It’s just this number that has become something that I guess sort of guides us. Or when we see it we feel like we’re doing the right things in life. Later this month, you will be releasing your sophomore album, “I’m Not Trying To Be You… Just Kidding I’m Trying To Be You.” Can you talk about what it was like putting this collection together? How has your sound grown on this album? Jade – We are both music lovers to a vast extent. We never started the band thinking we were a certain genre. We write songs we love and it’s as simple as that. This second album I guess you can say is an evolution of the first. It’s slightly different but most definitely a sister album to Libretto. Dennis – Yeah this album flowed naturally from the last one in that the songwriting just sort of evolved the way it was supposed to. I think there were two songs that we’re going to be on “Libretto” but ended up on this one because they fit with this group of songs better. Let’s talk about the album’s lead single, “I’m Not Trying.” Where did the inspiration for this song come from? Jade – The inspiration of this song is from us basically us becoming each other. We spend so much time together it’s hard to tell if we are trying to feel and act the same or if we’re becoming the same person. Dennis – I wanted to call the song *NSYNC. What do you think is the hardest part about being out on the road for long stretches of time? Jade – We love going on the road and playing for different crowds in new cities. I’d say the hardest part is leaving my cat, she’s my child. Dennis- I think it’s better for us to go out in small chunks of time. I think it’s better to keep things fresh and not feel like things are forced. I don’t wanna hate what I love. What musicians continue to inspire your music? Is there anyone that you would both love to work with one day? Jade- Whether it’s R&B or punk rock, the list of musicians that inspire me is endless. I’d love to someday work with Arcade Fire. They are a huge inspiration, or maybe Trent Reznor if he’d do a dark electronic dance pop album with us. Dennis – What she said. No, I’m open to working with a lot of artist. In my head these first 3 albums were going to be a reflection of where we come from so the DIY thing is perfect but after these initial releases I can’t wait to start working with some other artist. Dennis -I like to play with cheese. Jade- WTF? I don’t know Karaoke, hiking, live music, personal dance parties, exploring new restaurants and bars, smoking weed and watching a comedy. Dennis – I would say …. Have fun. Our songs are little stories most of the time and I think that’s whats fun about them and unique these days. I would hope when listening to our albums that you’re taken away from everything and dropped off somewhere in our sick imaginations. Yeah, we are coming to your town. Beware. Jazz Instrumentalist LIVINGSTON TAYLOR Discusses His Brand New Album, Safe Home And More!